GWINN — Dark and gloomy skies lingered over the Forsyth Township Ball Field on Monday night, but that didn’t prevent a Superiorland Baseball League game from being played. Thunderclouds only threatened as Coldwell Banker-Craig Heinonen and Jill Leonard-State Farm were able to complete a full seven-inning contest, with CBCH earning an 8-2 victory. Coldwell Banker improved to 5-3 on the season while State Farm dropped to 2-7 with one week remaining in the regular season. In the league’s other game Monday, the Negaunee Blasters outscored the Marquette County Mavericks 17-11 at Negaunee. Tayler Laurin earned the victory on the mound, going four innings as teammate Tyler O’Donnell was 4 for 4, scored four runs and was hit by a pitch. Brett Argall was also 4 for 4 with a three runs and a walk, while Julian Hornback was 3 for 5 with a double and two runs. In Gwinn, Coldwell Banker player-manager Paul Storm credited his team’s pitching and defense for a solid performance, while also receiving offensive production from a good portion of the lineup. 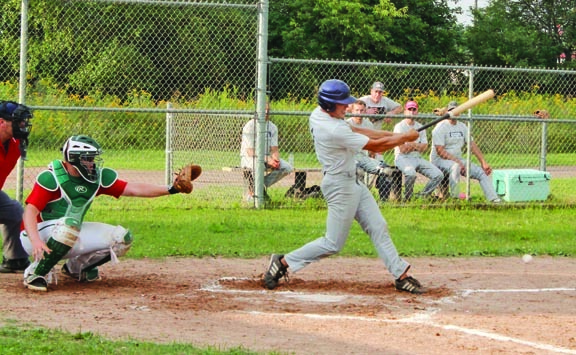 JLSF player-manager Zac Sorelle said the story of his team’s season is hitting the ball right to the opposition, and this game was no different. JLSF started the game by getting two of its first three batters on base. After Sorelle popped out for out No. 2, Nick Vogel knocked a base hit to left field which would have scored Kyle Dobson from second base. However, Dobson got tripped up rounding third and was tagged out to end the threat. CBCH followed in the bottom of the first with Craig Storm hitting a leadoff single to right. Paul Storm then doubled to left scoring Storm after the ball got beyond the outfielder. Later in the inning, Paul Storm scored when Kyle Storm grounded out to first, making the game 2-0. CBCH loaded the bases with two outs, but JLSF pitcher Shane Johnston struck out Dan L’Esperance to end the threat. CBCH added a run in the bottom of the third when Brian Pietila took second on a double steal, allowing Mitch Horton to score from third on the throw-out attempt to second. CBCH added three more runs over the next two innings before JLSF got on the board in the top of the sixth. After a leadoff hit from Aaron Karlstrom and a walk to Adam Ortman, Mike Hanold hit into a would-be double play, with Ortman getting forced out at second. However the relay to first was dropped putting Karlstrom on third and Hanold safe at first. With one out, Hanold advanced to second on a wild pitch before Aaron Schafer notched a single to center scoring Karlstrom for JLSF’s first run. Hanold eventually scored on a fielder’s choice to make it 6-2, but that’s all JLSF got as Nick Racine struck out to end the inning. CBCH added two more in the bottom of the sixth on an error, while Paul Storm closed things out on the mound. Daavettila went 2 for 3 with a walk for CBCH while L’Esperance was 2 for 4. Karlstrom went 3 for 3 for JLSF and Vogel went 2 for 4 with two singles. While the league will still have regular-season action on Monday night, playoffs begin Sunday due to scheduling conflicts as JLSF takes on the Negaunee Blasters with time and location to be determined. A final four will then be held on Saturday, Aug. 18. On Monday, JLSF plays at Channing while CBCH faces off against the Marquette County Mavericks.